Our Internet server at home had gone down some time on the previous afternoon and this was an issue for us. With our Internet server down we had no emails and no blog. So we asked Megan to go to our house and try and freeboot the server. Megan is not a tech guru but she did manage to reboot the server, but it still didn’t work. When we woke up we asked her to drive over again to our place so Chris could talk her through resolving the issue. When Megan arrived it seemed that there had been a power spike and this had corrupted the router which after a reboot started working properly. We were back on the air. Thanks Megan. Having resolved our IT crisis we now focussed on the day ahead. we has to be on a train at 12:18 so we decided to split forces. 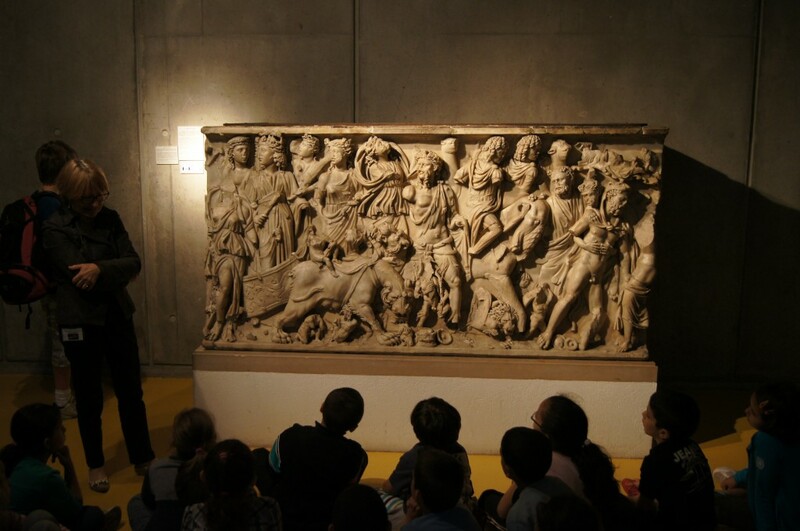 Chris would take the kids to the Roman museum while Di packed in the piece and quiet. The Roman museum was fascinating lots of Roman columns for Chris to practise his bad school boy Latin and lots of old things to interest Mathew and Sophie. We only had about 30 mins at the museum before we had to start back. We walked and ran back to our motel to find Di waiting outside with all the bags and ready to go. Chris ran to Bellecour to get a taxi and we set off for the station. We got on the train without issue and headed for Aix en Provence. We (Di actually) spoke to some American women on the train who were headed for Provence for a last minute relaxing holiday. The train arrived at Aix en Provence and we headed for the hire car place. This was going to be Chris’ first ever attempt at driving on the wrong side of the road. We loaded the car, a Ford Fiesta, to the gunwhales and headed off. It was a bit tense Chris trying to avoid killing everyone by driving into on coming traffic and Di trying to navigate. After hiiting one curb and a couple of drifts onto the wrong side the driving settled down and we headed for Bras. We stopped at a service centre on the road at a place called Roussett on the way and got some food and drinks. We later discovered that Matthew had left a shoe box containing his plasticine models at this service centre. Oops. We finally made it to Bras but the next problem was to find the Waerzeggers’ house. After driving right through the village without seeing the street name, we rang Helene who gave us some instructions and we headed back to the centre of the village. Fortunately Helene had rang her father and when we got back to the centre of town Julie and her Dad, Alain, found us and escorted us to their house. This was a good thing because we would never have found their street on our own. The streets in the village are very narrow with stone terrace style house fronts sitting right there on the narrow footpaths that meet the street. You have to remember that these have existed where they are for hundreds of years, before cars were invented. So if there is a car parked at the side of the road and someone walking on the footpath it is quite dangerous and you have to drive very carefully. We are surprised that we don’t see scrapes along the sides of cars. Having arrived at the Waerzeggers’ and said our hellos, Mathew, Sophie and Chris went for a swim. We were then taken to our accommodation which was a lovely weekender owned by family friends of the Waerzeggers about 1km further up the road. We returned to the Waerzeggers’ for dinner of asparagus and lettuce entree with Genevieve’s special dressing followed by moussaka that was so good even Matthew liked it. Dessert was ice cream. We had enjoyed our first night of village life in the south of France with lovely food and excellent company before heading back to our own villa in Provence for a sleep.